Country music singer/songwriter Russell Dickerson has an underdog tenacity that drove him to fight with all his might for a song that he believed in. After four long years of scrapes and knockdowns, he walked away a champ with one of the biggest love songs of the year. His debut single “Yours,” from his inaugural album of the same name, topped the Billboard Country Airplay charts for two weeks in a row and became a platinum-selling single. The song has also now hit over 100 million streams. “Every show, every station, every flight and every mile has been poured into the mission to take ‘Yours’ to the top, and I would do it all over again in a heartbeat,” says Dickerson. The success of the song earned Dickerson an Academy of Country Music New Male Vocalist nomination and a coveted spot opening on the upcoming Lady Antebellum/Darius Rucker “Summer Plays On” North American tour. The video for “Yours,” that his wife shot in an hour and a half from an open hatch of an SUV with a budget of only $6, is up for Country Music Television’s Breakthrough Video of the Year at the CMT Awards in June. Dickerson has released a new single called “Blue Tacoma,” which has entered the Top 10 on the Billboard country chart. 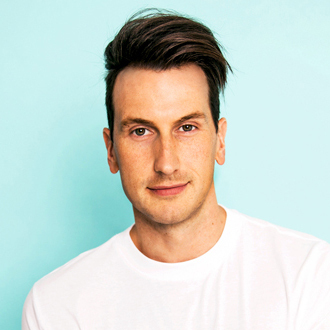 We are pleased to do this new Q&A interview with Russell Dickerson on his struggles to break in with “Yours,” how a love song for his wife has changed his professional life and how the songwriting process works for him. BC: You just celebrated your first number one hit, “Yours.” It was a long wait to get there, but it must have been worth it. Russell Dickerson: Oh, man. Yeah! To have a #1 song is such an accomplishment of itself, so regardless of how long it took, it’s such a huge honor to have a two-week #1 single. The journey was four years. It was January 24, 2014 when I wrote the song, and January 22, 2018 is the day it hit #1. To go from having a demo, pitched around trying to get a record deal and everyone said no…no record deal. Then, we basically started our own label and XM radio picked it up, and Spotify put it on a big playlist there. All of these things started building on each other. Then, we signed with Triple Tigers Records, and that’s when it went to terrestrial radio, and it just blew up from there. I think it was a 42-week climb. To work for something that long and for four years to believe in a song after so many people said no. I felt in my heart that this was the song that was going to go all the way, so until it happened I wasn’t going to give up on it. BC: How did you and your co-writers, Parker Welling and Casey Brown, put it together? Was it inspired by a love in your life? Dickerson: We all were at Belmont (University) together where we went to college. They had seen my relationship with my wife, and they knew what we had been through. So, it was easy for us to write a true honest love song. BC: What had you been through? Dickerson: With a lot of relationships, it takes sacrifice and all that stuff. My wife and I actually broke up for a second before we ended up getting back together and realized it takes sacrifice and selflessness to make it work. We broke up, and I had to figure that out real quick before I could tie the knot with this one. BC: You’re a songwriter and artist. What is it about the songwriting part of your life that you like? Dickerson: I started getting into songwriting around 2008. I signed a publishing deal in 2011, and I’ve been writing songs ever since then. Having written hundreds of songs now, it’s like once we wrote “Yours” you could just feel it was different. All of us knew it was a special song. It was the song I had written with [Parker Welling & Casey Brown] specifically. It was one of those songs that felt different and we knew it would be life changing for all of us. BC: How does the songwriting process work for you? Do you prefer to work with co-writers like you did with this hit, or write solo? Dickerson: It depends. There’s all different ways that songs come about. Some start with the titles, some start with the guitar licks, some start with a melody idea or a theme in mind. I don’t think there’s a specific algorithm you can put on songwriting for anyone. I think it happens all sorts of different ways. It’s fun to figure out. You never know. You have to jump in with an open mind every day and feel where the vibe’s going, take it all the way and try to write a big ol’ hit song. BC: Do you consider yourself a stronger lyricist or melody writer? Dickerson: I’m definitely more of a melody guy. I like piecing together the lyrics. I’d definitely say melody and just the overall vibe of the song. BC: Describe the crowd reaction you’ve received as the song became more and more popular over the last couple of years. Dickerson: It’s gotten to the point now where as soon as the first few seconds of the song are played, the crowd goes crazy. It’s really gratifying. They did a statistic at our number one party the other night, and I think it said the total reach was 1.9 billion people. I think that’s crazy how wide this song has gone. Every night the crowds go crazy as soon as they hear the first few seconds. BC: I’m sure you’ve heard lots of stories about how this song has affected people’s lives. Is there a particular story that stands out to you? Dickerson: There’s one story where they flew us out to the wedding to surprise the bride as she was walking down the aisle. It was really cool. We still keep in touch with them, and they send us pictures. They just had twins. That’s all because of a song. There’s other friends of ours that we played their wedding as well. We’ll get to have some people on stage to propose, and that’s always so special. It’s crazy how the power of music can bring people together. BC: As you mentioned, you were initially rejected by the major record labels. With the success of this single, has their tune changed? Dickerson: Oh, yeah, yeah. It’s funny because once it started playing on XM … the phone starts ringing. The numbers were crazy on XM. They said we haven’t seen anything like this since Florida Georgia Line’s (hit) “Cruise” came out.